Children in Key Stage 1 are given a piece of fruit daily at morning break as part of the government’s fruit for school project. Children who wish to eat a slice of toast during morning break can pay £1 per week. All children are allowed to bring fruit and vegetables as a break time snack, not crisps, cake or biscuits. Meals currently cost £2.20 daily. 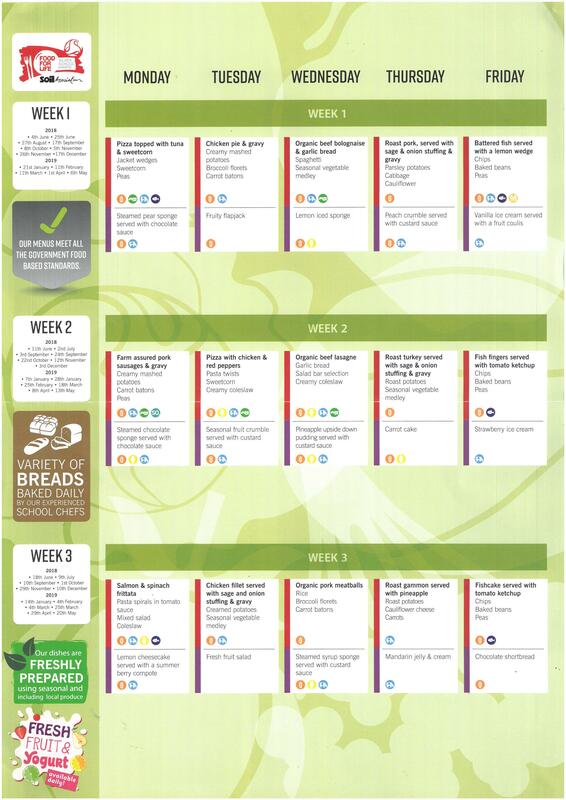 Each day there is a meat or fish course and a vegetarian option (please let us know if your child is a vegetarian). Dinners should be paid online, using the SchoolMoney.co.uk payment facility. Dinners need to be pre-booked by midnight of the night before they are taken. Tick the box next to ‘dinner top-up’ and select the week you would like to book your child’s meals for from the drop down box. A pop-up box will appear for you to select the days of the week you want to book. The total will calculate for you and be added to the total at the bottom of the screen. When you are ready, select the ‘make payment’ button and follow the instructions on screen. Children in Reception, Year 1 and Year 2 are provided with a free hot dinner and Mrs. White expects every family to take up this offer. Parents of older children needing information regarding free school meals entitlement should see the school secretary. Please inform the secretary if you think your child may be entitled to free school meals, even if your child would prefer to bring in a packed lunch as the school receives extra funding for these children. Children who choose to have a packed lunch should bring them in a sealed and named plastic lunch box, which is stored in the classroom. Glass containers or fizzy drinks should not be brought into school. Please do not send nuts into school, either as spread or as a snack, as we have some children in school with nut allergies. We do not allow the children to have sweets in their lunchboxes.